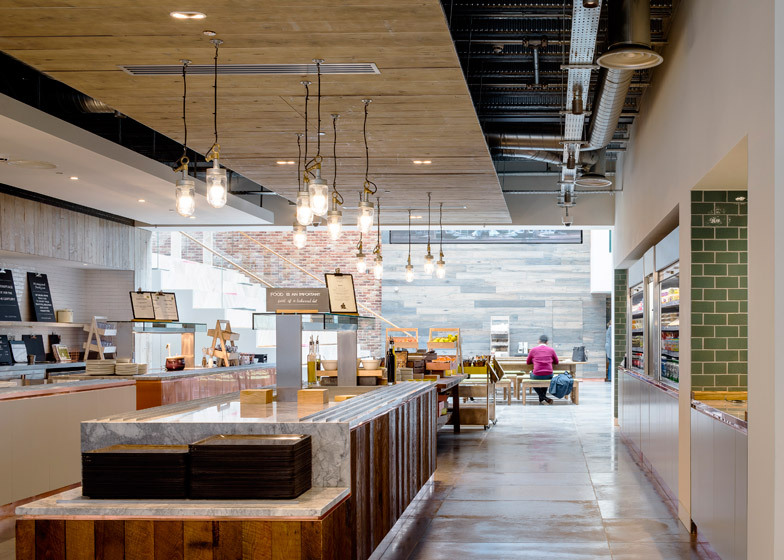 Recycled shopping bags and clothing labels adorn the walls at budget fashion retailer Primark's international headquarters in Dublin by British studio MoreySmith (+ slideshow). 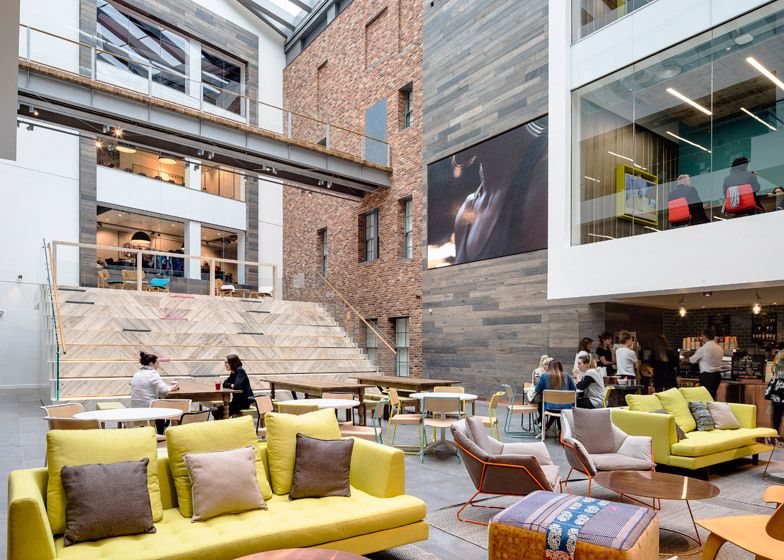 To create Primark's new headquarters, MoreySmith connected a 20th-century listed building to an adjacent property constructed in the 1990s, with a 13-metre-long timber and steel bridge that crosses a central atrium. The atrium – which had originally been an external courtyard – includes cafes, a bar, and informal working areas. 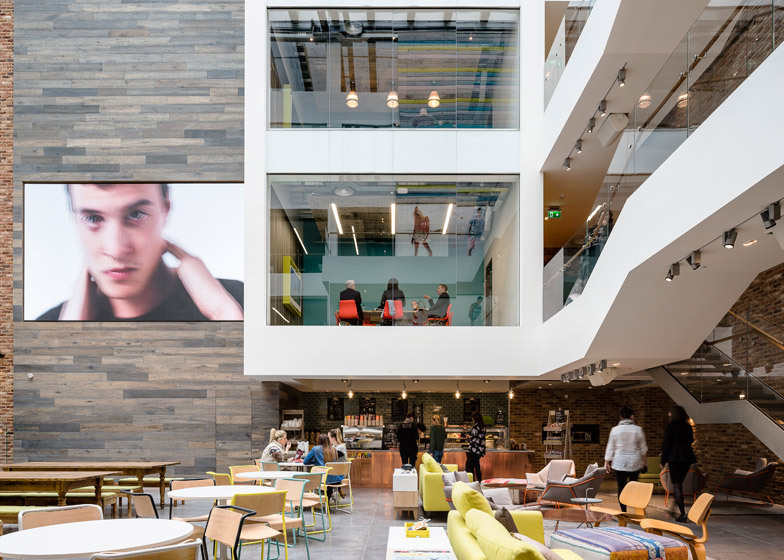 The space is topped by a glazed roof that brings natural light into the four-floor office, which houses 600 members of Primark's staff. The office also houses photographic and design studios, a reading room stocked retail-focused reading matter, and a gym with exercise equipment. "We took the best of the vintage and contemporary of both buildings to create a unique central social space, complete with creative studios, meeting rooms vertically stacked, balconies and stairways which form the common architectural language," principal director at MoreySmith, Linda Morey-Burrows, told Dezeen. 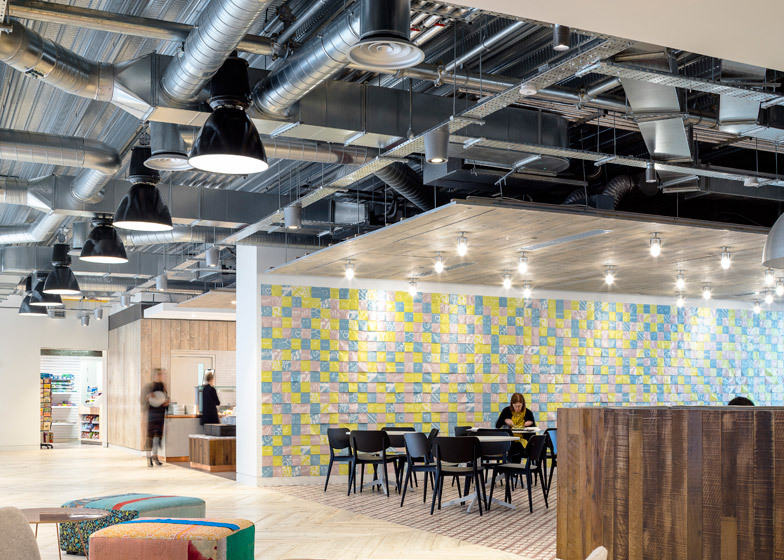 A key part of MoreySmith's brief was to create an office that would reflect the values of the brand, and the history and heritage of the site. To this end the building's original brickwork has been exposed by the removal of partitions and suspended ceilings. "Working with such a fantastic listed building, we really wanted to restore and expose as much of this as possible. The area has such an interesting industrial heritage so we wanted to draw on this," said Morey-Burrows, whose studio has also designed the headquarters for drinks brand Coca-Cola, online fashion brand ASOS and energy drink company Red Bull in London. "We have really tried to open up the whole space," she added. "So now you can see all the way across from Parnell Street through to the courtyard with views into Mary Street." Reclaimed scaffolding boards and cast-concrete tiles are used to create flooring, and the office is lit by reclaimed factory lights – all chosen to reference Dublin's industrial heritage. 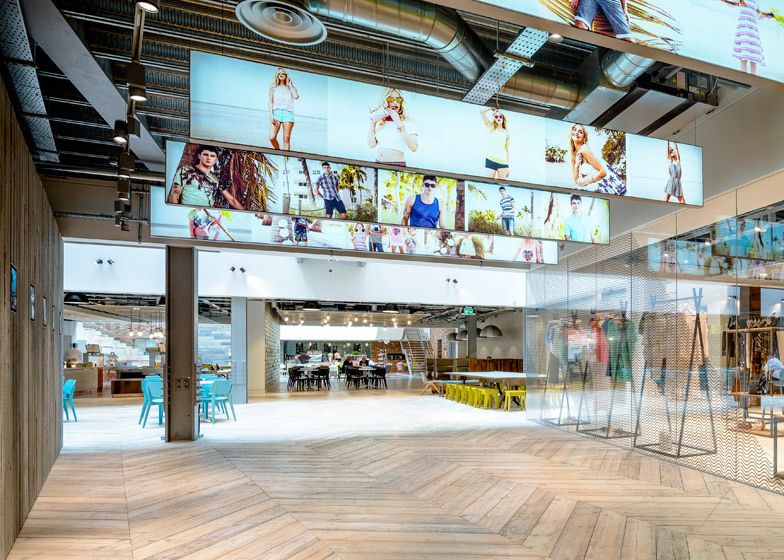 Large light boxes and felt-covered walls also run throughout the office – intended for fashion buyers to pin new campaigns and textiles – and feature walls have been covered in bespoke wallpaper, as well as recycled shopping bags and Primark labels. 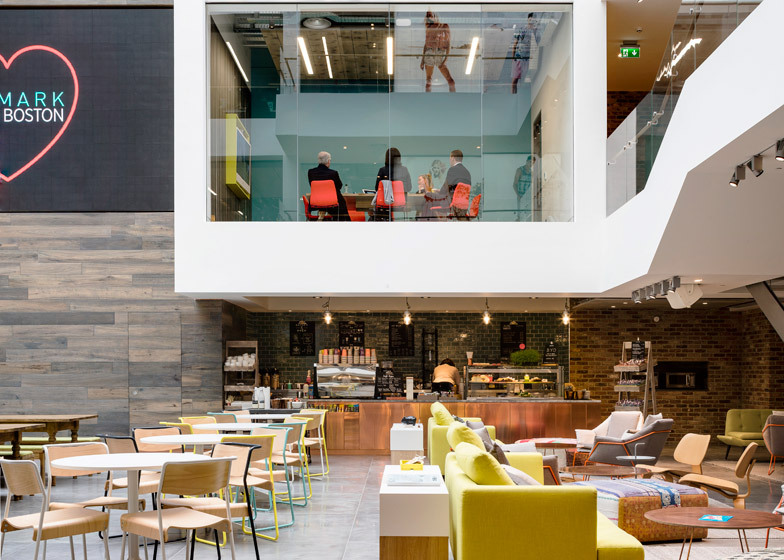 "There is a common architectural language but with unique interior details celebrating Primark's heritage such as bespoke signage and graphics, which were an integral part of the design," said Morey-Burrows. "We have tried to ensure every part of the business looks as vibrant and interesting as the fashion buying and merchandise teams." Other offices for clothing brands include the OMA-designed Amsterdam offices for G-Star Raw and the west London headquarters of Net-A-Porter by Studiofibre.